Now that you've spent so much time reading the above, I suggest getting started on this island. You can do this by going all the way right to the Pumpkin Patch. There, you'll meet Linus and Lucy. Talk to Linus, and he'll tell you he's picking out the heaviest pumpkin for Lucy. Help him by dragging a pumpkin onto the see-saw (this is inside a mini-game.) Then keep dragging pumpkins to the other side. If the see-saw changes position, then that's heavier and you can switch to the other side. If it stays the same, then drag another pumpkin to that side (no need to drag the other one off, it'll happen automatically.) The one that stays down for the entire test is the heaviest. Drag that one to Lucy. This is pretty easy, but you have only 30 seconds to do it before Lucy's patience runs out! Now you'll have to carry the pumpkin to the house (why does it have to be the heaviest one in the patch?..) This is pretty straightforward, just roll the pumpkin along the course (it's shorter than what you may have expected.) Once you reach a checkpoint, push the pumpkin past it so that the next time you break the pumpkin, you won't have to start over. Oh yeah, and don't break the pumpkin (avoid dropping it too far.) Beware of the rabbits, they'll bounce your pumpkin up, but they can sometimes be useful (and sometimes not.) There's a part where you may bring the pumpkin backwards and down a hill to get a checkpoint. When you reach the log, just ram the pumpkin full-force into it and it will get through. On the hill, jump in front of your pumpkin before it gains too much speed. Then slowly go down in short bursts, allowing the pumpkin to push you. Don't let it roll backwards down the second hill, or you and your pumpkin will drop into a bottomless pit! In the end, you'll have to carry it past the people on the swings. Stay in between the swingers and pass when they are on their way back. Once you're at the house, talk to Linus. He'll give you the trick-or-treat bag he promised. Then you'll see Lucy murder (sort of) the pumpkin. Later that day, Charlie Brown arrives and they start arguing about which holiday figure exists. Charlie Brown ends the discussion by stating that they are separated by "denominational differences". Then, go outside and talk to Pigpen (go a little right of the house.) He will give you a lemon sucker in exchange for the trick-or-treat bag. Take this back to Linus and give him the sucker. He'll take it and give you his Halloween party invitation before going to the pumpkin patch. Grab his pen before exiting the house again. He will thank you and Snoopy for helping him with the yard. But then, Linus flies in out of nowhere and reverses all our work! Then he leaves to mail his letter to the Great Pumpkin after complaining about his sucker. Well, what do you expect when you go diving into a pile of leaves with it in his mouth? Anyway, chase after him to Main Street and meet him at the mailbox (it's halfway between Violet's and the Van Pelt house. Van Pelt is Linus and Lucy's last name.) He's lost his security blanket! I think I know where it went... run back to the backyard. Click on the pile of leaves. You'll see the pile from the top-down. Move your mouse quickly in clockwise circles to blow the leaves away. And there's Linus's blanket, sitting at the bottom of the pile! Click on it and take it and talk to Linus again. He'll be glad he got his blanket back, and then he'll mail his letter. Then, (wheeze), go BACK to the backyard and scout out the scene there. Lucy is trying to get Charlie Brown to kick the football, but Charlie refuses to do it because of Lucy's reputation. Then he says he wants a signed agreement from Lucy that she won't do any trickery. Give him the pen you found at the Van Pelt house, and Lucy will sign it. But then, at the last second, Lucy pulls the football back like she always does. Oof! Charlie falls on his back again. So the document was never ratified, eh? Well, it IS Halloween. After they've left, collect their football. Take it to the bottom of the tree, and kick it (USE it.) 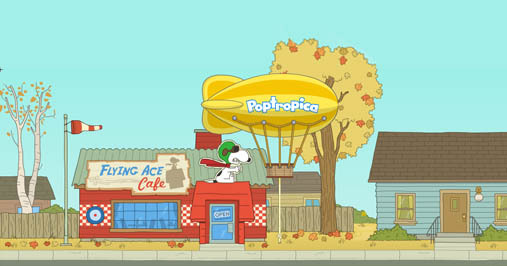 You'll see Snoopy's aviator cap fall down. Now, get ready for the fun part of this island! 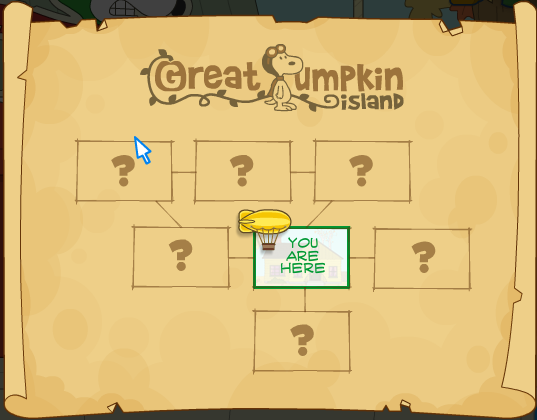 This next part is very similar to the museum part in Counterfeit Island. All you have to do is go right, hiding behind bushes and other objects. You can also hide in the stream. But just avoid the searchlight, or you will be caught! When you reach the house, hide behind the railing (you'll automatically go behind it.) The moment the searchlight is gone, climb up onto the railing. Then jump onto the roof and hide behind the chimney. Once the beam goes away, jump off the roof and click on the scarecrow to take the mask. Then go right. Most people get stuck on this part, and I agree too that it's kinda tough to get past. Once you're past this area, wear the mask and then enter the old, rotting house. Wait a minute... it's just Violet's house! You're at the Halloween party! Now you can participate in some fun (and sometimes hard) party games until it's time to go trick-or-treating. Follow the instructions below. This is the first and simplest party game. Talk to Lucy to begin. Here, you have to click on the apples to collect them. You need six to win the game, but you only have three misses so be careful! You have terrible aim in this, so click immediately after your mouse passes over the apple. Try to only grab apples that are close to you, because they disappear fast. Then go onto the next party game. This one is very simple. You can even skip this if you want. All you have to do is draw a jack-o-lantern face on the back of Charlie Brown's head, and it'll show up on the pumpkin. You'll be congratulated even if your model looks nothing like a jack-o-lantern. This one can get kind of hard. You'll see a pumpkin move around on the screen, and then everything will go black. Then you have to try to pin the mouth, nose, eyes, etc. on the pumpkin. If you get over 70% at the end, you win! I have a tip for this: while the pumpkin is moving around, keep your finger on the nose (or some other object you can relate to later on.) Then, put all the other facial objects on the pumpkin relative to the point you chose. This one is very tough to beat. Talk to Schroeder and he will let you play his piano. Now, you must hit (click) the right keys as the falling dots land on the squares above them. If you time it right, the dot will turn green and vanish. As long as you get enough of them to keep the blue progress bar past the red line, Snoopy will dance. If he’s still dancing at the end of the song, you win. This is also similar to Guitar Hero or Rock Band. After you've beaten all the party games, it's time for trick-or-treating. But first, you can talk to Linus in the pumpkin patch (you'll end up there automatically.) He's planning to spend the night in the Pumpkin Patch, waiting for the Great Pumpkin. Sally volunteers to accompany him. Go left and click "TRICK-OR-TREAT" to begin. All you have to do here is ring he doorbell at every house. Then, candy and rocks will start flying out. Jump up and try to collect a different type of candy at each house, while ate the same time avoiding being hit by rocks. Once you've filled the bag (3-4 houses), run back to the Pumpkin Patch. You'll see Sally mad at Linus for making her miss Halloween. Hmm... seems like the Great Pumpkin didn't come. But what's this? Wow! it's the Great Pumpkin! Or not...it's just Snoopy. Give her your bag of candy, and she will thank you and walk away in disgust. You offer to trade places with her. Later that night, Lucy will arrive at the Pumpkin Patch and thank you for taking care of Linus, who is sleeping on the ground. She will give you the Great Pumpkin Island Medallion. Hooray!